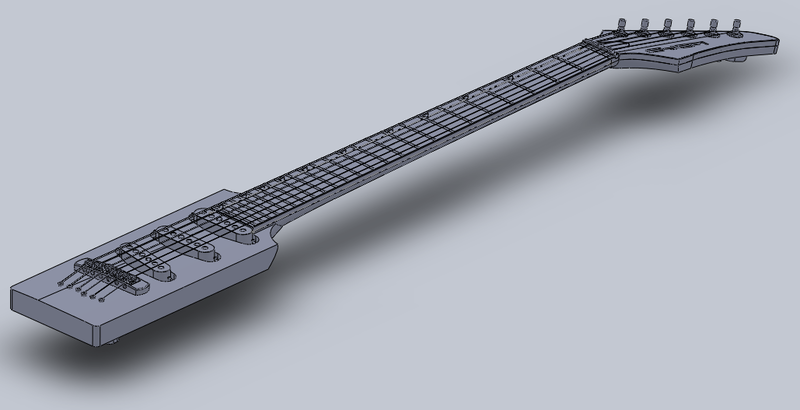 I like the basic idea behind the original Steinberger design. The idea is to keep only what’s needed —the bare essentials that define an electric guitar. The idea actually started from Les Paul himself when he started building “The Log” which became the precursor to the legendary Gibson Les Paul. The Log, as he likes to call it, is essentially a Gibson neck glued to a 4×4 block of solid pine. The body sides were added only for appearance to make it still look like a guitar. An ugly contraption, but I digress. Ned Steinberger, the man behind the Steinberger, got rid of the body sides and also got rid of the headstock altogether. It is also one of the first of a breed of guitars that used modern materials such as carbon fiber and graphite. 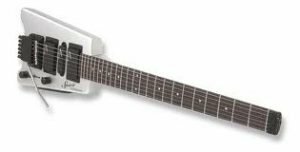 Developed in the late 70s, the Steinberger was ahead of its time. It still is. However, the headless and bodiless design never really took off as its inventor intended. Except for a few devoted followers, guitarists in general never got used to it. Later designs kept the headless neck but added at a body. Some designs also include a headstock. I think these moves are attempts to win the hearts of the general public. Looks matter and for some reason, guitarists are rather conservative when it comes to shaps. Is this perhaps because the guitar’s shape evokes the graceful female figure? 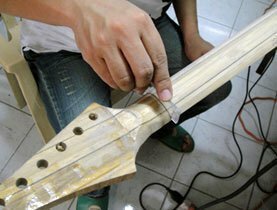 Following the basic premise that the essential factors that make an electric guitar is the neck, just enough body to allow a bridge and a tailpiece that anchors the strings, pickups, and of course the tuners, we’ll start with the middle neck-thru section. This is the most crucial part of the guitar and should be structurally sound and sonically excellent. 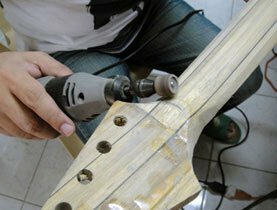 In the section on bamboo preparation, we detailed the manufacturing of the composite material intended for the construction of the central neck-thru piece. This consists primarily of laminated bamboo interspersed with carbon fiber. In this section, we will walk through the process of actually shaping the material into our final neck-thru form. Compared to hardwood, bamboo planks are a lot more difficult to machine. 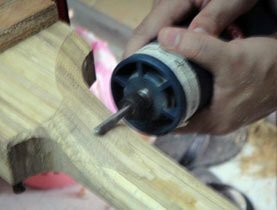 Router bits and planer blades easily get dull because of the tougher grain structure. Also, while bamboo is very tough, it is very easy to tear-out the bamboo’s perfectly unidirectional grains. 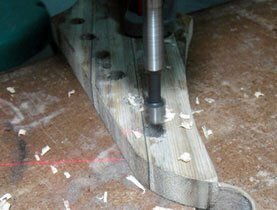 It is best to remove as much material as possible prior to routing. 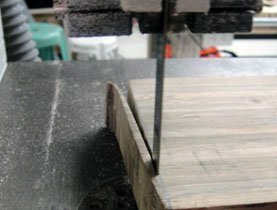 A bandsaw cuts excess material very close to, but outside the outline. 6 mm (¼”) bandsaw blades make sawing intricate curves easy while wider 12 mm (½”) blades are good for straight lines. Inner cavities are best pre-drilled using Forstner bits. 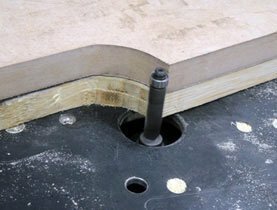 12.7 mm (½”) diameter, 19 mm (¾”) long pattern following bits (with bearing on the shank) guide the router through templates made from 19 mm (¾”) thick MDF board. It is best to cut slowly with successive 6 mm (~¼”) deep passes. As a general rule: don’t attempt to remove too much wood. Multiple passes work much better than removing a lot of wood at one time. 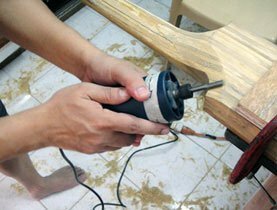 Use the router as a precision cutter. 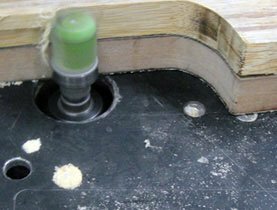 The router bit rotates counter-clockwise. In some places, the counter-clockwise movement of the bit will cause splinters when the blade pushes the end-grain outward. 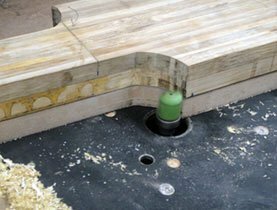 In this case, it is better to flip the body where the template is at the top then use a flush trim bit with the bearing at the end instead of the shaft. A hand-held plunge router serves this purpose so I do not have to change bits and flip the workpiece. For shaping the back of the neck, my favorite tool is the trimmer router with a solid carbide 4-flute 12.7 mm (¼”) end mill. These are typically used for machining metal, but are surprisingly well suited for shaping bamboo. As always, treat the tool with respect. This is a dangerous tool. 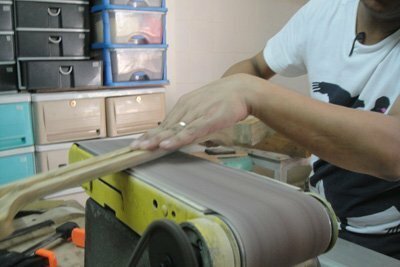 After rough shaping, the belt-sander is another indispensable tool. Every once in a while, the neck profile is checked against profile templates made from acrylic plastic to make sure that the shape is true to spec. 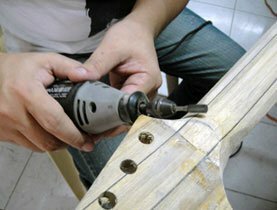 For those intricate curves, the Dremel is a very capable and versatile tool.